A Love Letter to the Great Lakes mural festival in Toronto was the first fresh water edition of PangeaSeed Foundation’s Sea Walls: Murals for Oceans project, which aims to bring awareness to issues surrounding our water resources, their inhabitants and those who depend on them. This week of art and activism was a collaboration with Hermann & Audrey, Montreal artist Jason Botkin and an amazing group of organizers and change makers to create large scale public art in the form of murals in the theme of fresh water protection, centred around the neighbourhoods of Queen West and Ossington Ave, Queen West and Spadina Ave, and the lower Don River. As part of our contribution to Toronto’s first ever large scale mural festival, we present our own love letter to the lakes, the artists, and all involved in making this project a reality. Please enjoy. Learn more at PangeaSeed.org and loveletterprojects.com and write your own love letter today. PangeaSeed Foundation, the international marine conservation organization, is thrilled to announce the conclusion of its inaugural partnership with the Napier City Council, Resene, and Alternative Arts Initiative to create a series of Sea Walls: Murals for Oceans in the coastal town of Napier, New Zealand. This international collaboration of concerned organizations and artists took place from March 10-21, 2016, and creatively beautified the surrounding area of Napier, while bringing awareness, collaboration, and inspiration to the community. More images and info after the jump! Berlin based street fine/street artist REKA One has recently been in Denmark for the Roskilde Festival where he’s been painting up a storm. In his vibrant and abstract style, here are a number of beautiful new pieces. Street artist Bordalo II recently finished up a new piece in Lisbon for the Centro Cultural de Belém. Utilizing his signature recycled junk art technique the Portuguese artist nailed this mural alongside his current solo exhibition “Pânico, Drama, Terror” at Arte Periférica. One of our favourite street artists Bordalo II is now in Northern Europe where he just finished working on a brand new piece entitled “Froehlicher Tucan.” The Portuguese artist gathered local trash and found materials to create another unique and innovative piece. 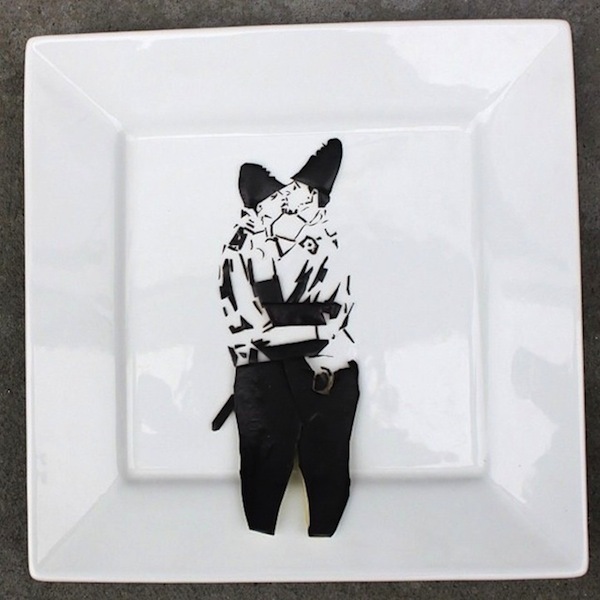 American artist Harley Langberg has created a series of food art inspired by infamous British street artist Banksy. Langberg uses slices of fresh vegetables and fruits to recreate Banksy’s popular street art murals on plates.